Written by John DeSalvo, Ph.D.
Power Crystals is a well written, well researched and simply all around good book about quartz crystals. It is written from the viewpoint of a scientist who does believe in some mysticism. John DeSalvo, Ph.D. gives us a very good and detailed overview of quartz crystals, from their elemental makeup to where they can be found to several theories as to why they are so frequently used in spiritual practices, divination and energy healing. He even goes into some detail on how to scry and divine with them, such as using one as a pendulum. DeSalvo organizes the book in a way that makes sense as well as makes it easier to read; starting with what exactly quartz crystals are and then going into more depth such as the types of crystals, their uses and then crystal skulls and crystals in alien technology. 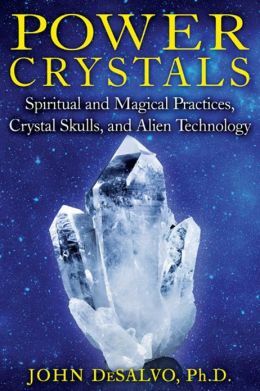 This book is quite different from other books on crystals in that not only is it only about quartz crystals, but DeSalvo talks about crystal skulls, such as what exactly is one, where do they come from and do they have a purpose, to crystals as they relate to UFO's and alien abductions. In my opinion this really sets this book apart from others and makes it a fascinating read. All in all I really have enjoyed reading this book. Though at times it seems clinical, I really enjoyed reading Power Crystals and DeSalvo's take on crystals. He thoroughly researches them, gives his opinion, the opinion of others, scientific fact and still at the end of it all encourages his readers to form their own opinions given the information presented. For anyone interested in crystals, I highly recommend this book.